A new-build 38 metre semi-displacement Sanlorenzo SD126 motor yacht has been sold with the buyer introduced by Andy McDougall at Sanlorenzo Spain. Due for delivery in February 2020, the new yacht will be built from a GRP hull and superstructure to a design by Francesco Paszkowksi. Accommodation is for ten guests in five cabins, while the crew quarters allows for a staff of seven people. As with every yacht in the Sanlorenzo SD126 series, she will be heavily customised to suit her owner’s exact tastes. Although interior details are yet to be confirmed, Sanlorenzo offers a range of fine marbles, stainless steel and stitched leather. Al fresco relaxation options are plentiful, with spacious entertainment and dining areas on both the upper deck and the bridge deck. Meanwhile, the all-important superyacht sundeck will be fitted with a bar, sun loungers and a Jacuzzi spa tub. To date 17 Sanlorenzo SD126 yachts have been sold and delivered to their owners, with a further four units currently in construction. This example will be powered by twin 1,469hp MTU diesel engines offering a maximum speed of 16 knots and a range of 3,000 nautical miles at 11 knots. 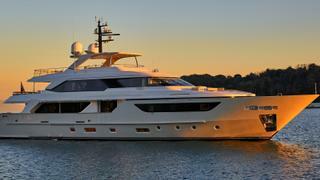 The asking price of the Sanlorenzo SD126 has been withheld.